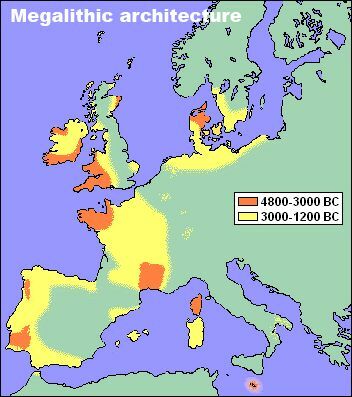 France has been occupied for a long time, and megalithic structures and monuments were built by those occupants starting back in the Neolithic (late Stone Age) and Chalcolithic (or Copper Age) over the period 4800-1200 BC. 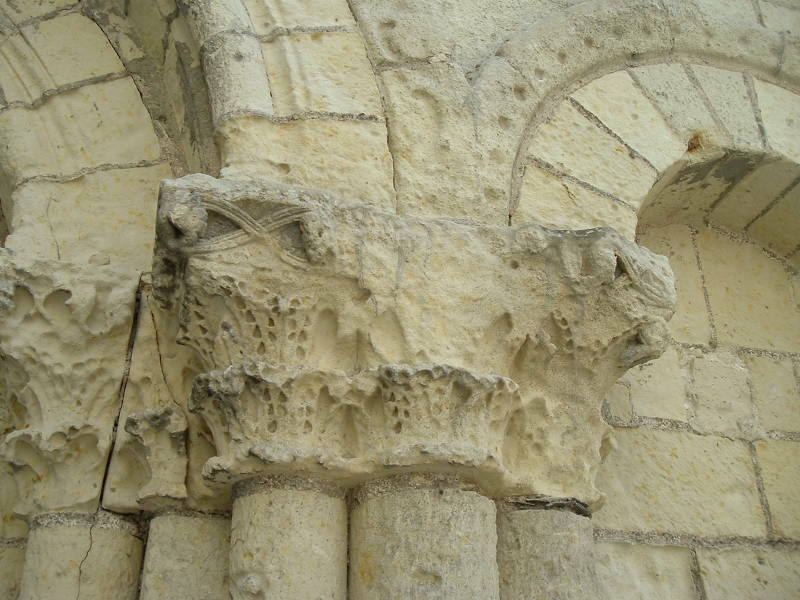 Some of these can be visited today in the lower Loire river valley near Saumur. Megalithic structures take a variety of forms. 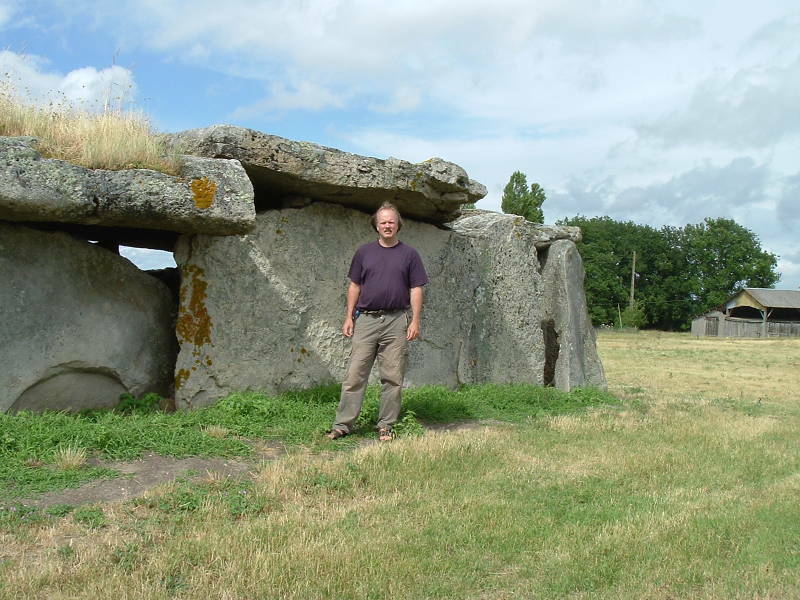 The dolmen is a common one — a large flat capstone forming a roof over an enclosed space. The capstone may be supported by large orthostats, upright stone pillars or panels. The result is a structure, sometimes as large as a house, built from these large stone slabs. This type of simple but sometimes impressively large stone structure is found all over Europe and Asia. The Korean peninsula is home to an estimated 35,000 dolmens, concentrated on the west coast of South Korea. There are thousands in India, over 3,000 in the north-western Caucasus region, in the Middle East, in Turkey and Bulgaria, and throughout western Europe, Britain and Ireland. 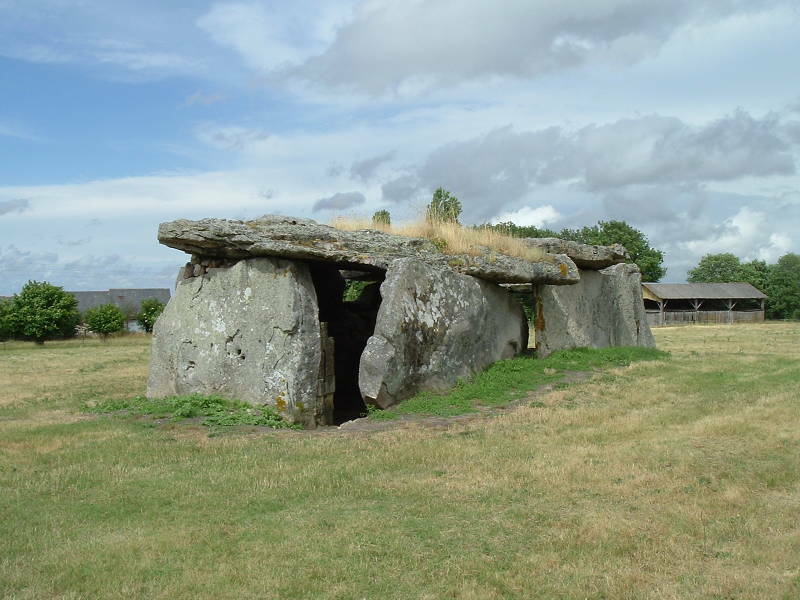 The oldest dolmens were erected in Western Europe around 5000 BC. The name dolmen appeared when Théophile Malo Corret de la Tour d'Auvergne, who has been described as "a celtomaniac antiquarian", seems to have introduced it in his book Origines Gauloise. 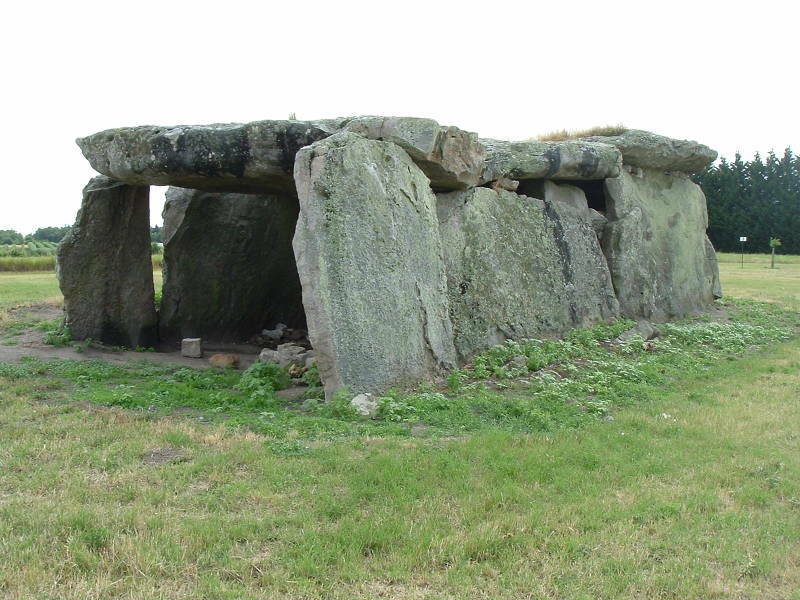 The British were calling that type of structure by the Welsh term cromlech. 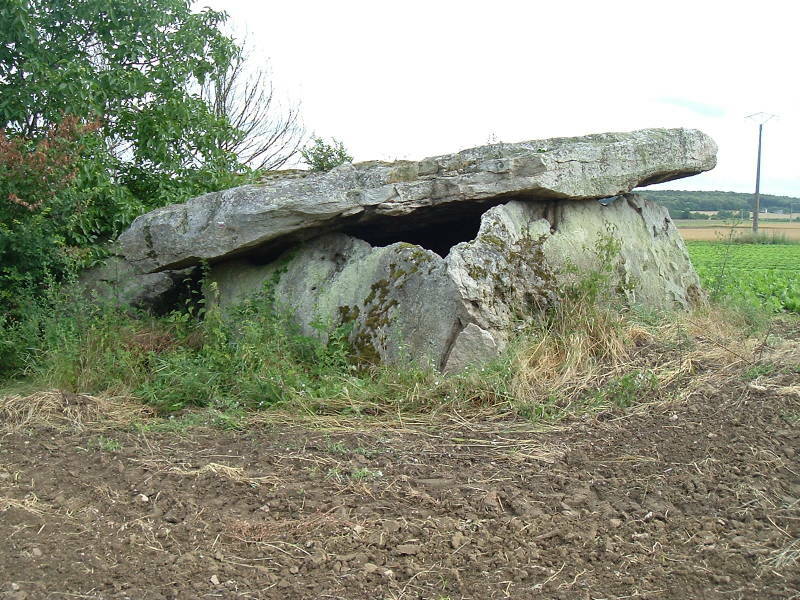 There have been claims that "dolmen" came from a Breton language word for "stone table", but that doesn't seem to be the case. In the 1750s the Cornish language used tolmen for what the Welsh called a cromlech, and it seems that la Tour d'Auvergne used that term with an altered spelling. 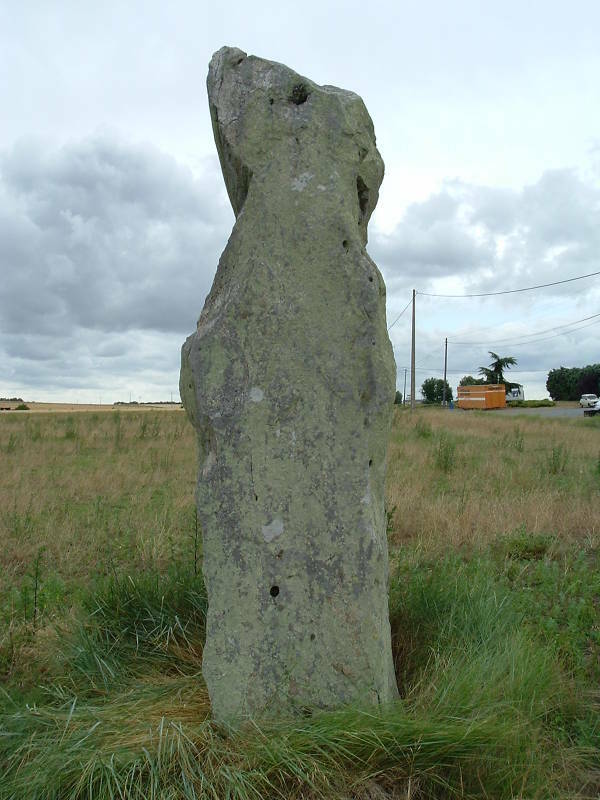 Menhirs, or standing stone pillars, are also common. They may have patterns or notched cut into them, or they may simply be large stones stood erect. All of these words are from languages that came along long after the structures were built. Saumur is a small city in the lower Loire River valley, between Tours and Nantes. Megalithic structures were built here around 3000-1200 BC. 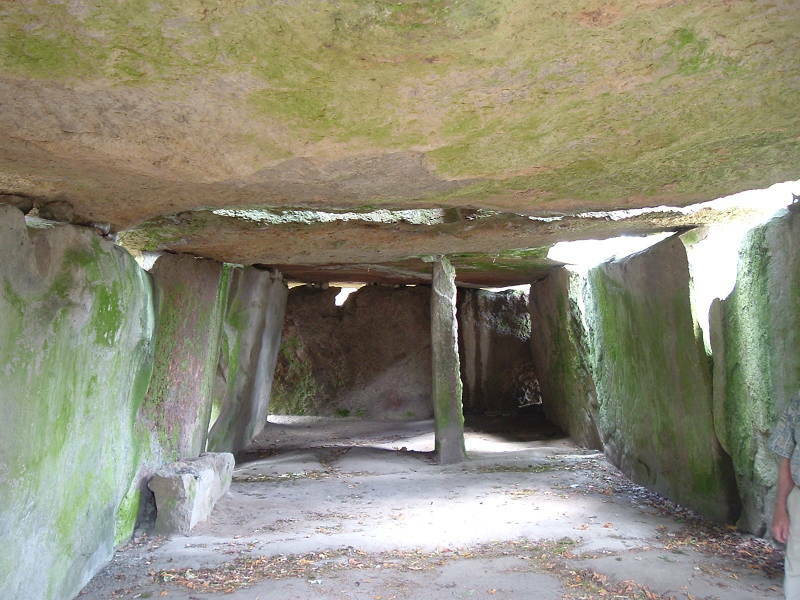 The area is close to Brittany, famous for the number of megalithic structures to be found there, built starting a millennium earlier. 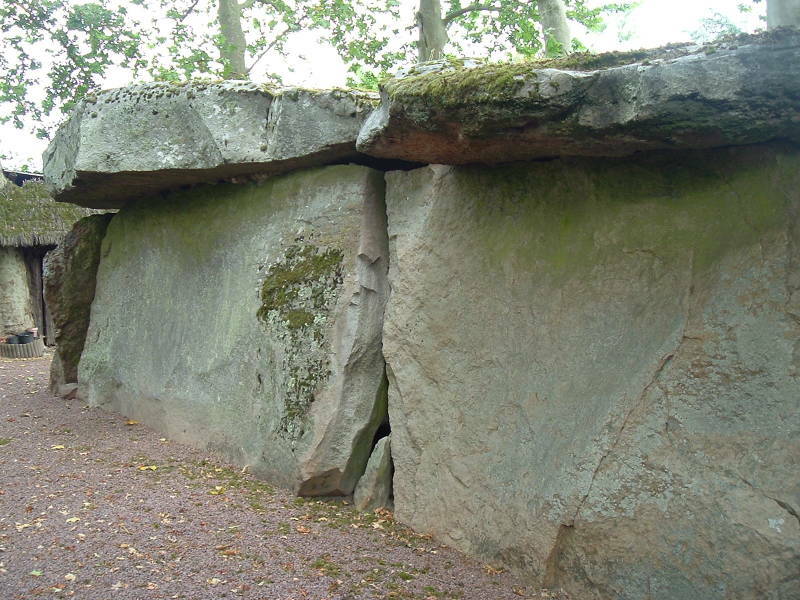 One very dramatic megalithic structure is the large dolmen of Bagneux. The settlement of Bagneux used to be a separate village. 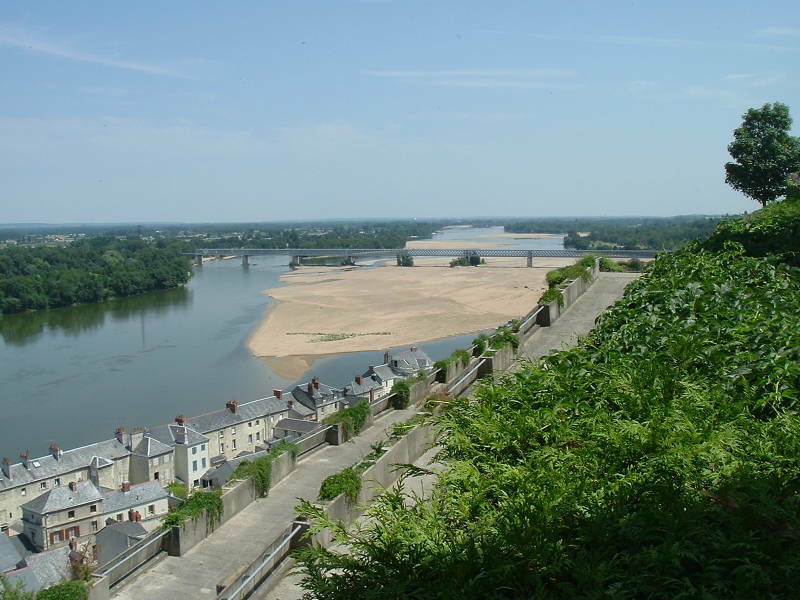 But with the growth of the city of Saumur, Bagneux is now an outlying district of Saumur. 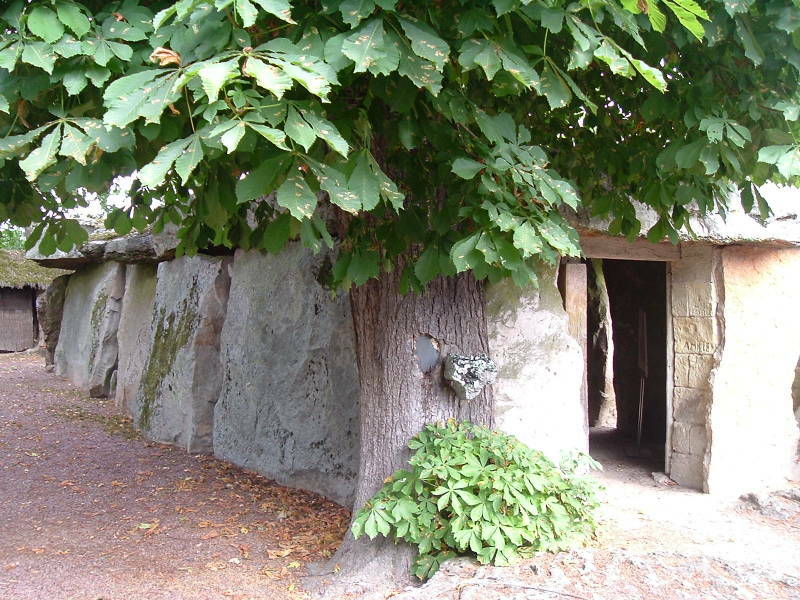 The Bagneux dolmen is some 23 meters long, built from large slabs of the local sandstone. It's built from 15 huge monolithic slabs, weighing a total of 500 tons or more. We're at one end of the dolmen in the first picture, looking from one end toward the other. The vertical stone seen at the center here is not a support unit, it is a remainder of an interior partition wall. The large capstones span across the orthostats or not-quite-vertical slabs forming the side walls. The largest of the four capstones is 7.6 meters long and weighs 86 tons. The slabs are of Senonian sandstone. They were probably transported no more than about a kilometer using wooden rollers. However, the builders must have been very highly motivated to undertake such an enormous project in an era before metal tools. As for standing up the side walls and placing the flat slabs on top, that wasn't actually how they would have done it. The orthostats or nearly vertical side wall pieces would have be dragged onto mounds of dirt and slide down into trenches, then pulled with vegetable ropes and leather straps to get them into position with about one-third of their height below the eventual ground level. Then fill the interior with dirt, build up a ramp outside, and roll the enormous roof slabs into place. Then dig out that supporting dirt fill. This is enormous by dolmen standards, with over 90 square meters of interior area. 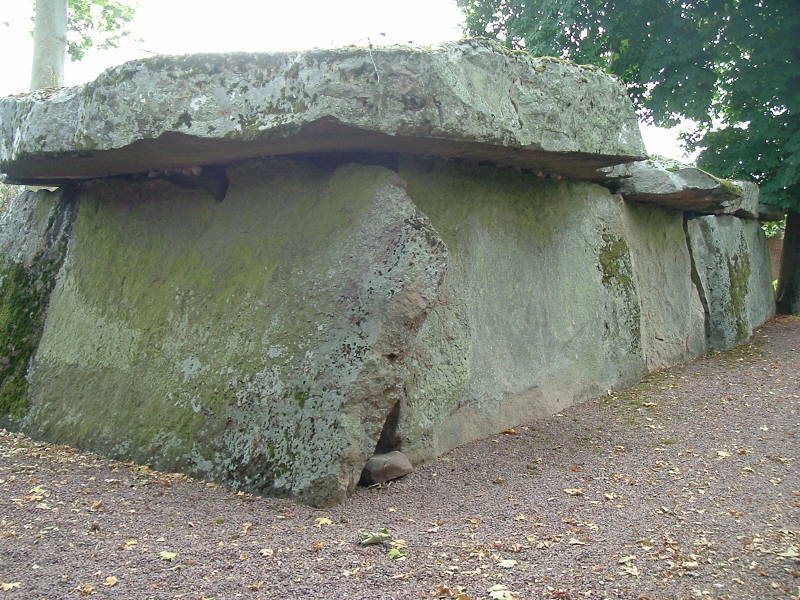 By most measures this is the largest dolmen in all of France. 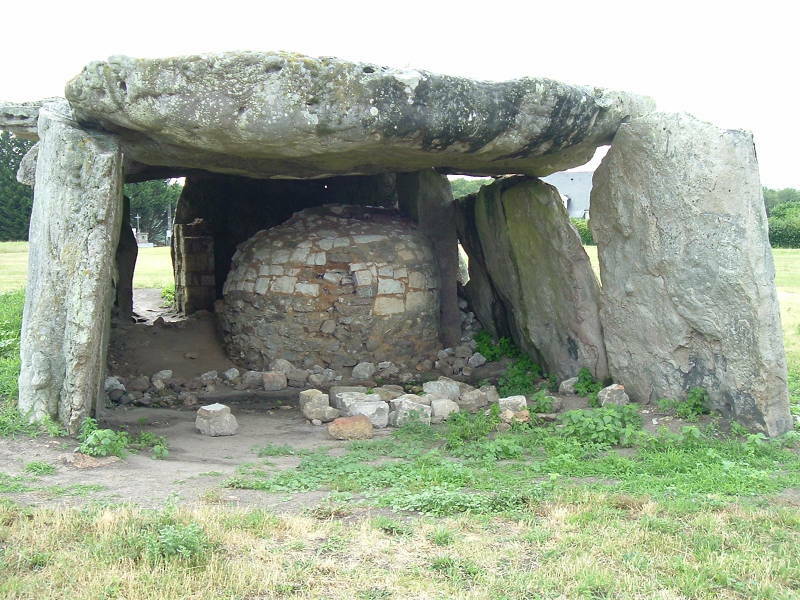 This is the largest dolmen in all of Europe in terms of enclosed volume, and it is the second longest in Europe. 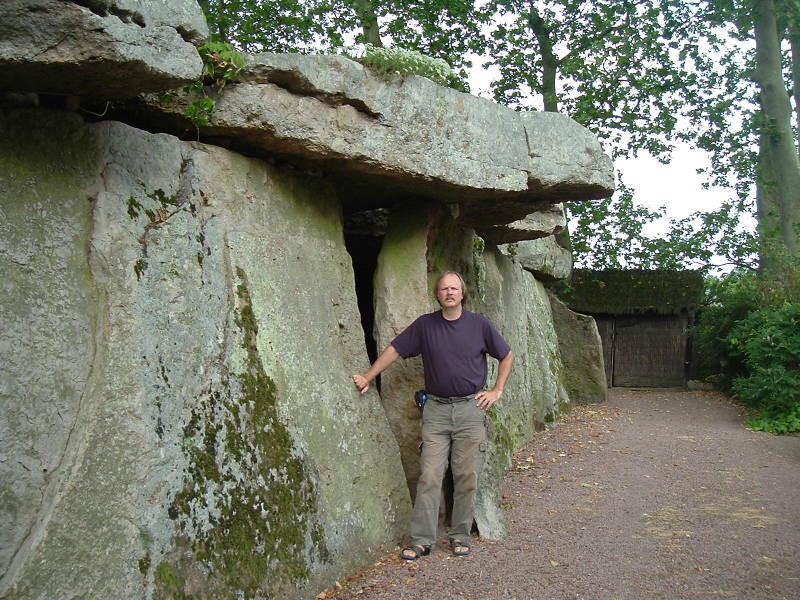 The dolmen opens toward the southeast, the same as almost all the dolmens in this region of eastern France. 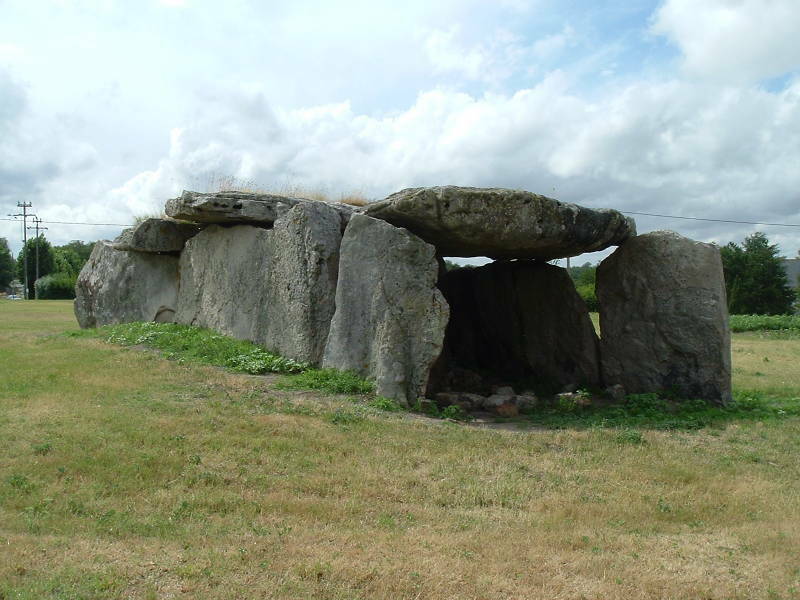 Bagneux is some distance from the Loire River, the dolmen is three to four kilometers away from the river through Saumur on the D374E road then turning off, appropriately, onto the Rue du Dolmen. 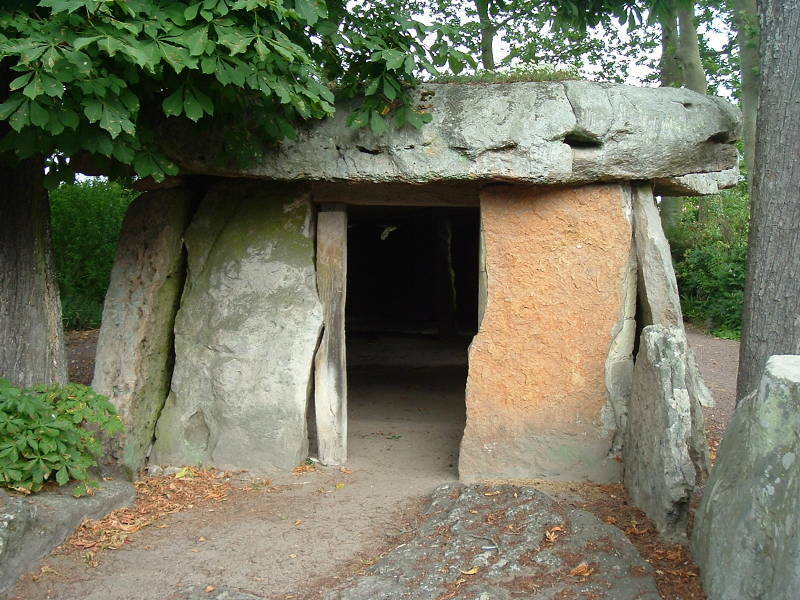 The dolmen is, by far, the largest and most impressive of the megalithic remains in Bagneux, but it is not the only one in the area. 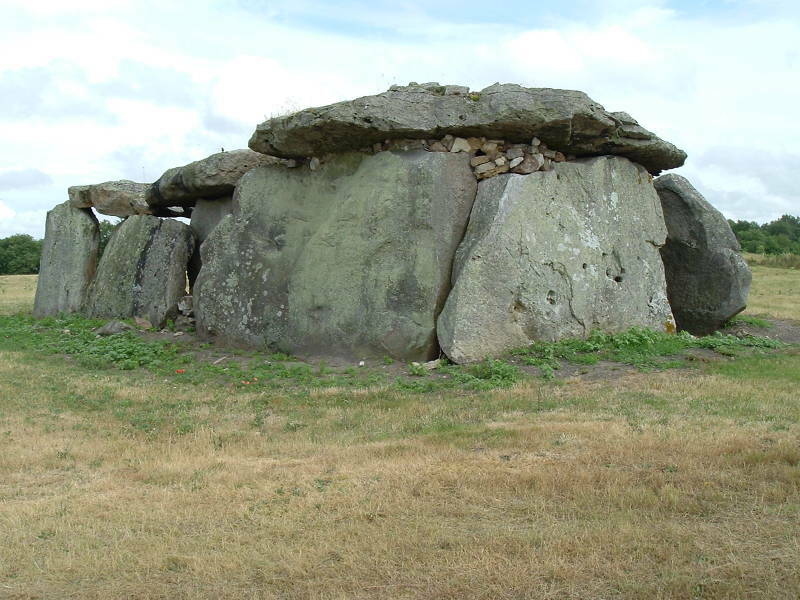 Several other megalithic sites are in the Maine-et-Loire département, some of which you will see below. A number of prehistoric axes and a flint spear point have been found in the area of Bagneux. Moving from prehistory into historic times, Bagneux was mentioned in 1096 in the form of Villa Benniolus. The historical record also mentioned Prioratus beati Petri Batnox in 1258, and bartholomeus de Betgnos in 1277. 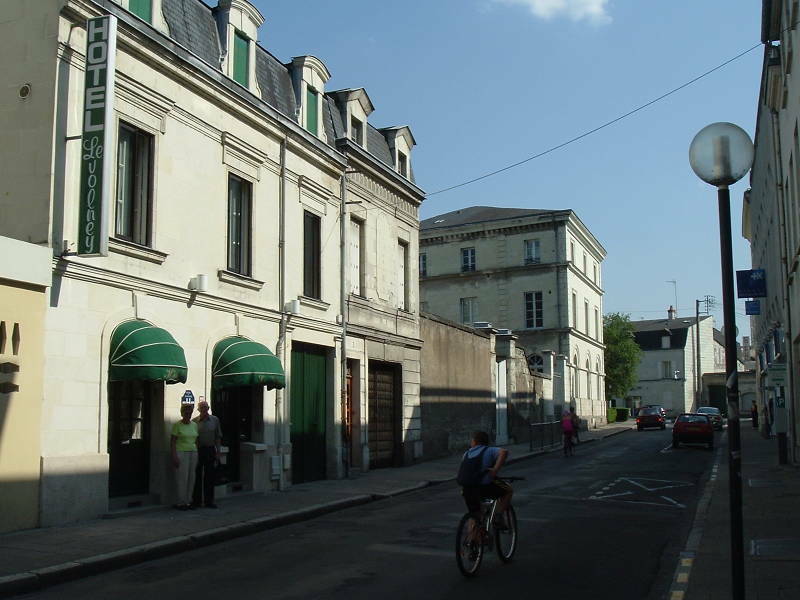 The Hotel le Volney is a nice place to stay in Saumur. There is frequent passenger rail service to Saumur. But be aware that the train station is on the north side of the very wide Loire river, a kilometer from the center of the city. 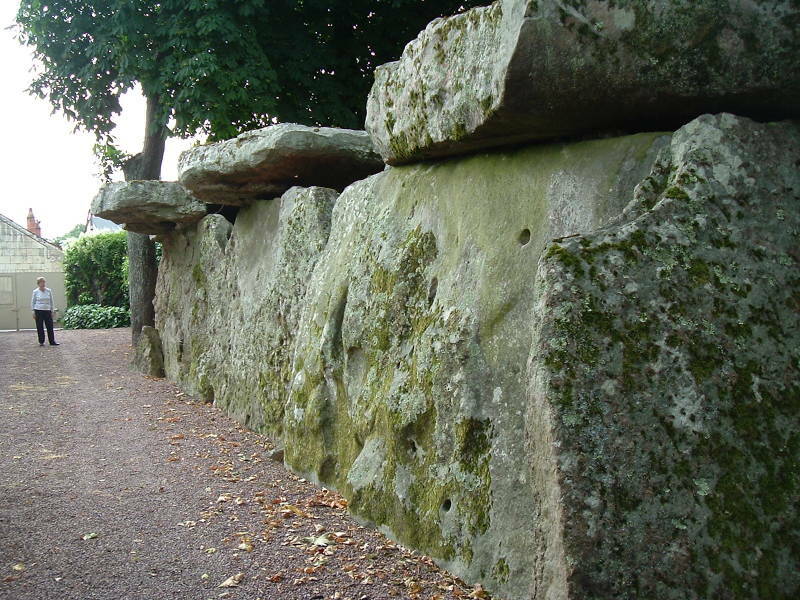 The city of Saumur is nowhere near as old as the nearby dolmen. There obviously was a human presence in the area going back to the Neolithic, but there is little sign of a town before the Dark Ages. The Viking leader Hasting sacked the settlement of Saumur in 845. Then in 960, Thibaut the Cheat built the first version of the Château or Castle of Saumur. At right we're looking down over the Loire River from the castle. In the late 900s, Geldiun, the lord of Saumur, was a vassal of the Counts of Blois, leading to some military strife that continued off and on for centuries. We're looking back at the old part of town from one of the bridges across the Loire. The Château of Saumur that we see on the skyline was built on what Thibaut the Cheat first built in 960. Saint Louis built reinforcements starting in 1227, and then Louis of Anjou replaced the old round towers with octagonal ones in 1367. King René of Anjou (1409-1480) made significant improvements to the entire castle complex. The Italian Bartolomeo strengthened the defences in the 1500s, adding a set of outer curtain walls and bastions. It was a jail under Louis XIV and Napoleon, then it became an ammunition depot. The city bought the castle from the state in the early 1900s and gradually renovated it. It now houses the Museum of Decorative Arts. The spires and massive buildings nearer the river and our viewpoint are the City Hall. 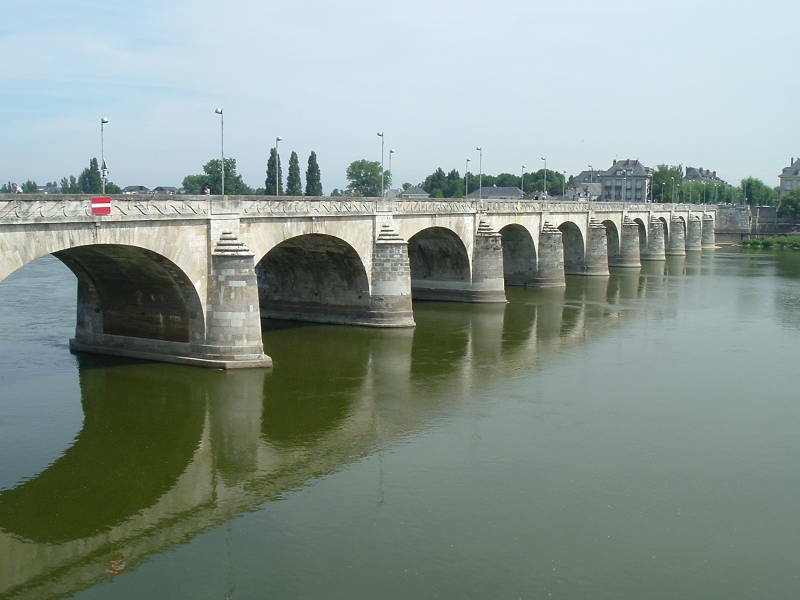 The Cessart Bridge is one of several bridges crossing the Loire River in and around Saumur. These river crossings have been of strategic importance through the centuries. Now significant highways run down both banks of the river. The rail line is on the right bank, the north side, across the river from Saumur. 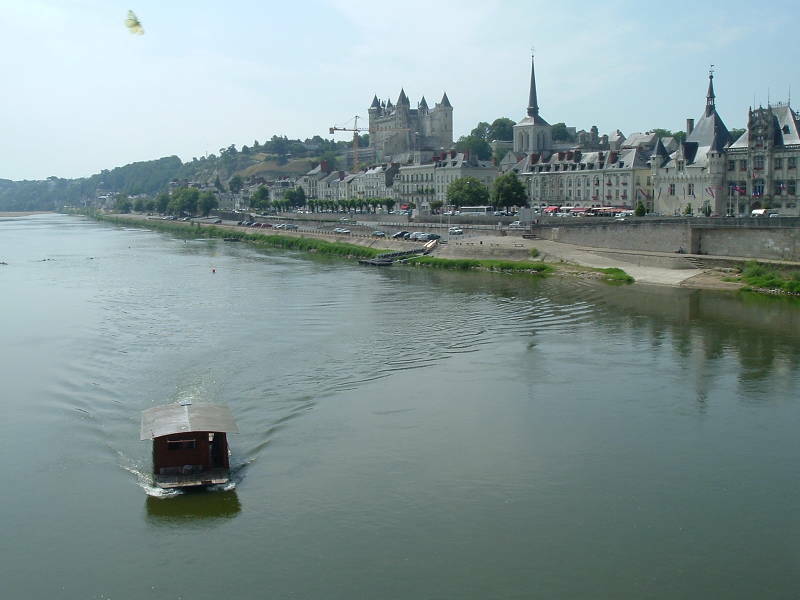 The river widens and there is a sizeable island mid-stream, so it is a walk of close to a kilometer from the center of Saumur to its train station. The Cessart Bridge, like many of the buildings in the city, are built from the very soft yellow limestone of the region. 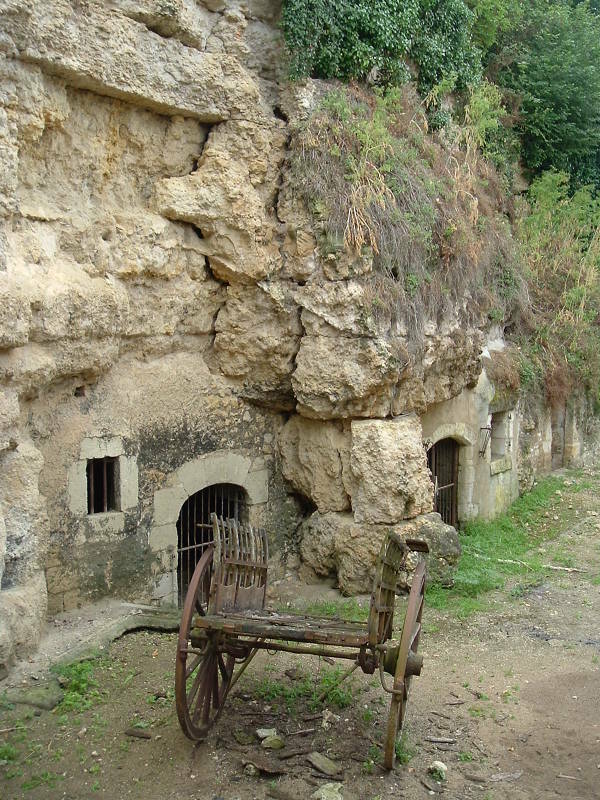 The area around Saumur has an estimated 1,200 kilometers of underground galleries and tunnels and other troglodytic structures, including some 14,000 underground chambers, half of them abandoned. Chambers are used for storage, agriculture, and even as homes. 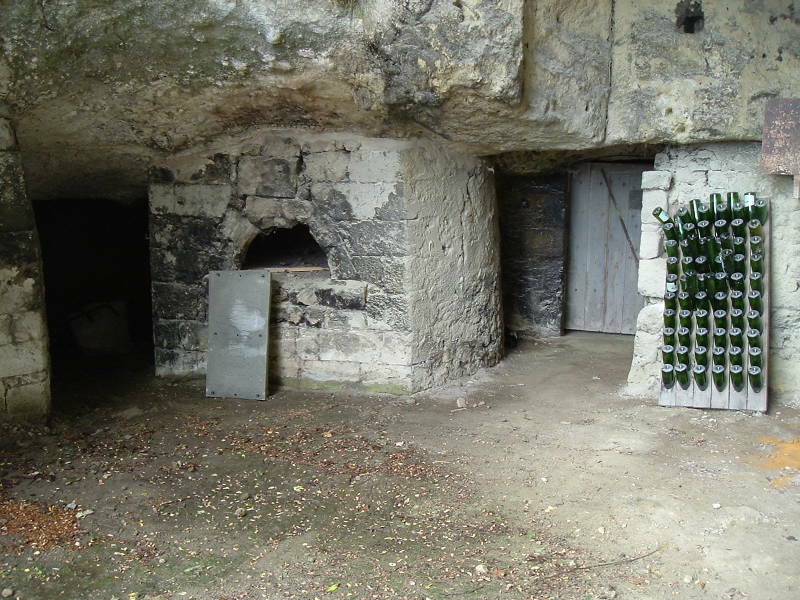 Many of the chambers cut into the soft limestone bluffs along the Loire River are used as cellars for the many prominent vineyards, and many others are used to raise mushrooms. Saumur is surrounded by the Saumur vineyards themselves, plus those of Chinon, Bourgueil, Coteaux du Layon, and others, producing some of France's most renowned wines. 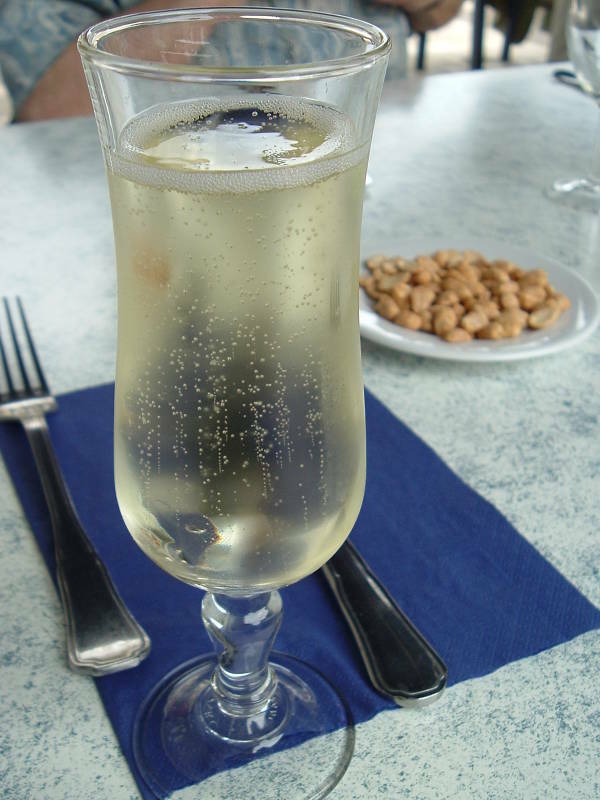 Many of the Saumur wines are sparkling. 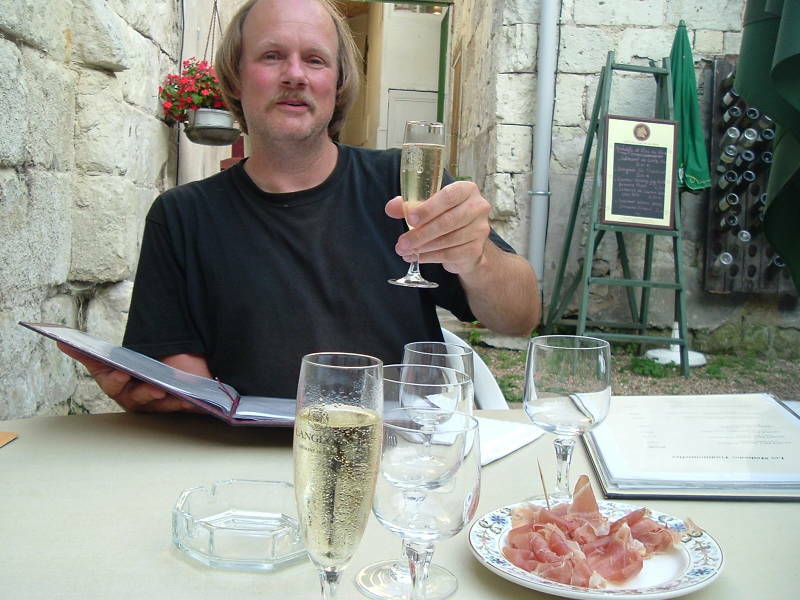 Enjoy some sparkling Saumur wine with your meal! 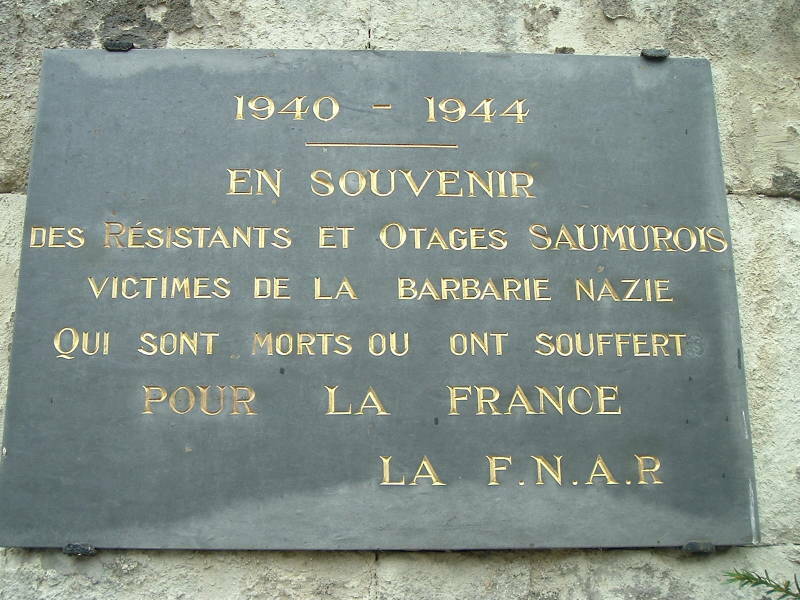 Signs throughout France commemorate local victims of Nazi barbarism. A large cavalry school was established in Saumur before the revolution, after 1945 it became the School of the Application of Armored Cavalry. Related to this, Saumur now has a very large museum of tanks and other armored vehicles. The invading German forces arrived in 1940. A group of 786 cadets from the cavalry school, together with students from a non-commissioned officers' school and a company of North African infantry, about 2,300 men in total, fought to defend the bridge against the advancing German cavalry division. With no armor or air support, they managed to resist a militarily superior force for 36 hours. Overnight on 8-9 June 1944, just three days after the start of the Normandy Landings, a quickly organized night bombing raid by the RAF struck a railroad tunnel at Saumur, the only north-south rail line across the Loire. A German Panzer division was expected to use the tunnel to move tanks to engage the Allied forces still arriving on the Normandy beaches. A group of planes dropped flares for illumination and others marked the target area. Then a flight of 25 Lancasters of the No. 617 Squadron RAF dropped 12,000 pound "Tallboy" bombs. They successfully hit a bridge and a railway cut, destroying the bridge and causing a landslide at the cut that buried the tracks. But the greatest damage was caused by the Tallboy bombs that hit their target points above the tunnel and functioned as designed, penetrating through 60 feet of earth before detonating. This collapsed the tunnel and greatly delayed the German Panzer movement. The tunnel was still blocked when the Allied liberated the area in August. The Tallboy bomb was designed to penetrate the earth or hardened targets. Its casing was a single piece of cast high-tensile strength steel ten feet long. Its highly aerodynamic exterior shape made its terminal velocity much higher than conventional bombs when it was dropped from high altitude as designed. The armored casing was about half of the total 21-foot length, the rest was a large tail fin with a slight twist that spun the dropping bomb about its long axis for stability and greatly improved accuracy. Dropped from 18,000 feet at a forward speed of 170 miles per hour, it reached a velocity of 750 miles per hour by impact, allowing it to pass through 16 feet of concrete. For use against underground targets like the Saumur tunnel, the bomb had three intertial firing mechanisms that triggered detonation after a specified delay. Separate long-delay fuses at the tail of the assembly provided a backup detonation mechanism. The Tallboy was designed as an "earthquake bomb". It was aimed at the target, but the intent was that it would burrow into the ground near the target and detonate there, better coupling the explosive force through the solid earth into the target, causing more complete destruction and making any repair even more difficult. Other Tallboy raids were made against hardened submarine pens, V-1 and V-2 assembly and launch sites, other railway tunnels, and other high-priority hardened targets. 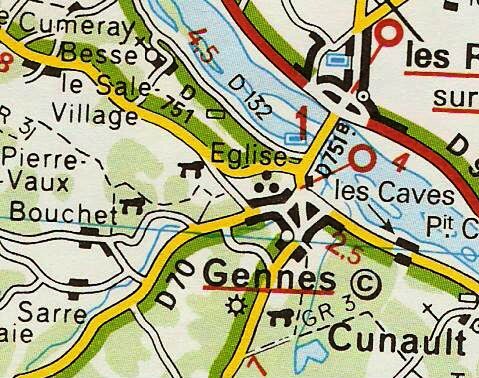 There are so many monuments mégalithiques in France that Michelin has a symbol for them on their excellent maps. The symbol looks like a tiny dolmen. 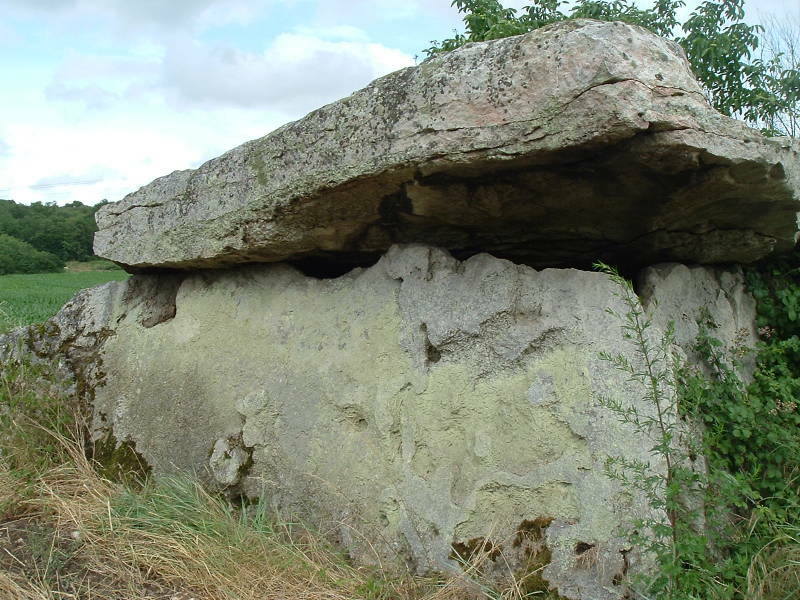 There are three megaliths immediately around Gennes, a small town about 15 kilometers down the Loire, west from Saumur. The first is a relatively large dolmen along the west side of the D 69 road just south of Gennes. 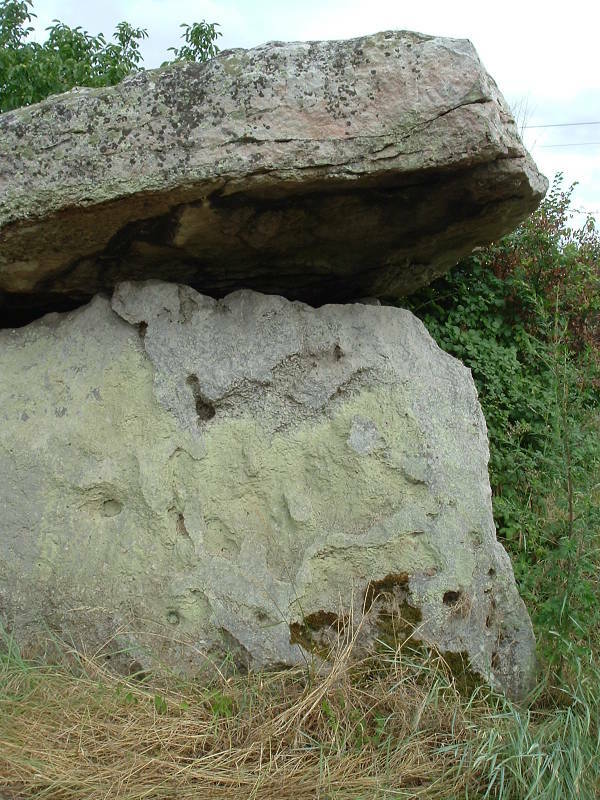 The second is a smaller dolmen about 400 meters north of a small lane leading to the settlement of Bouchet. 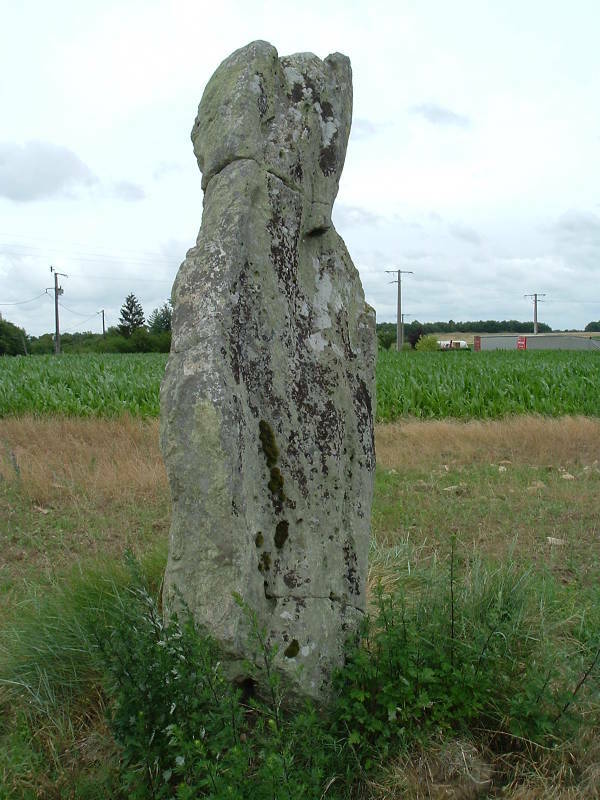 The third is a menhir or free-standing stone pillar along the D 751 road northwest of Gennes heading to Coutures and on toward Angers. Here's the first of those, the dolmen along the D 69. It's about 12 meters long and 5 meters wide. This one is called La Madeleine Dolmen. As you head south out of Gennes, the road climbs a hill. 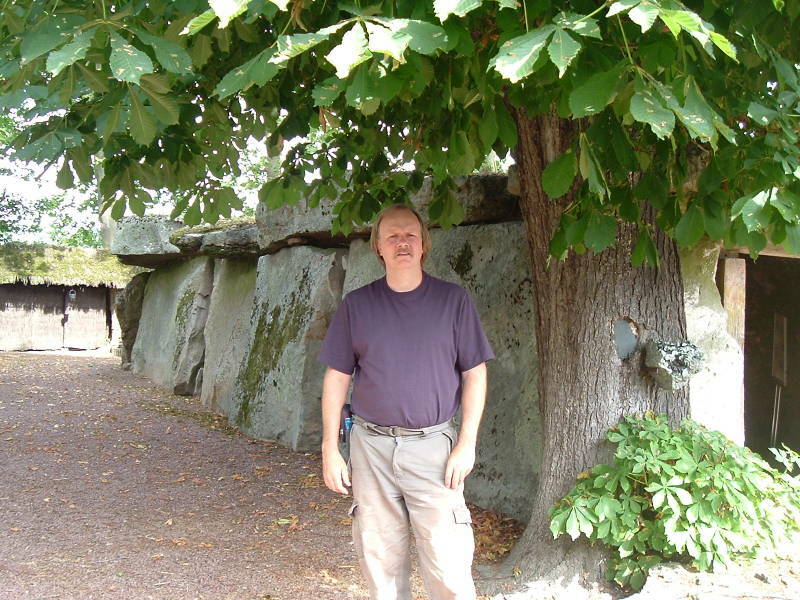 The dolmen is very obvious off to your left as you reach the top of a hill out the south side of Gennes. 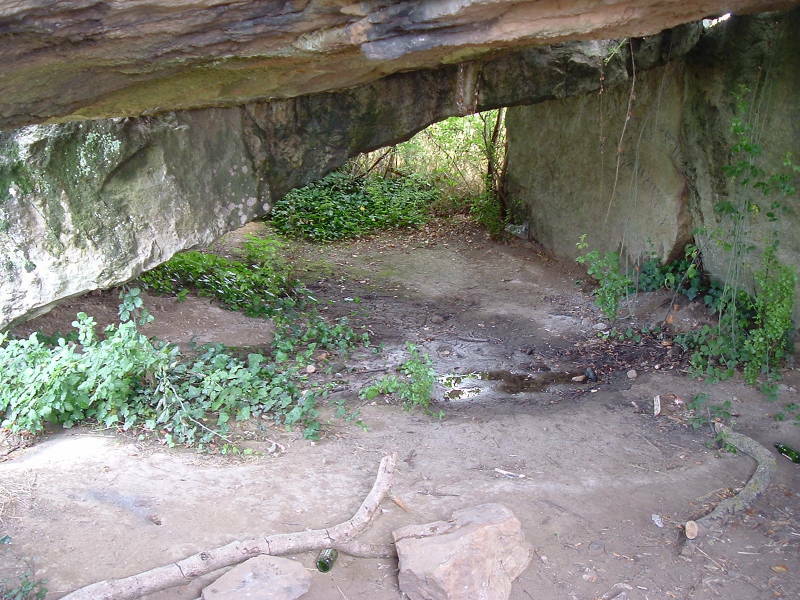 The dolmen was used in the mid to late 1800s as a bakery. 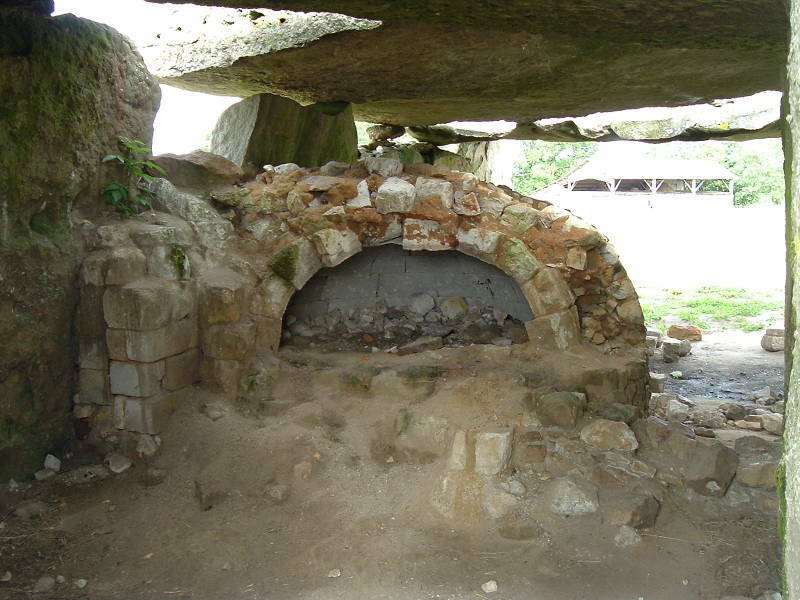 The 19th century bread oven is still there. History of an entirely different time scale! 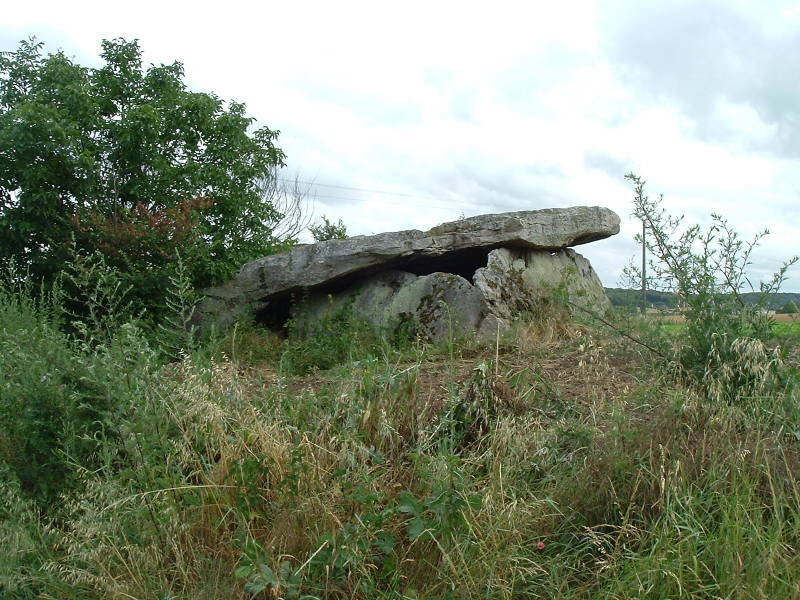 The second dolmen around Gennes is about 400 meters north of a small lane. The lane leads through a farming area between Gennes and the small settlement of Bouchet. There is a sort of track back toward the dolmen between to crop fields, but it quickly gets muddy and quite soft. Park along the road and walk in! This is called the Dolmen a la Cour d'Avort, although Avort is a small settlement significantly to the southwest along the D 70 road, while this is off a small lane well off to the side of the D 70. 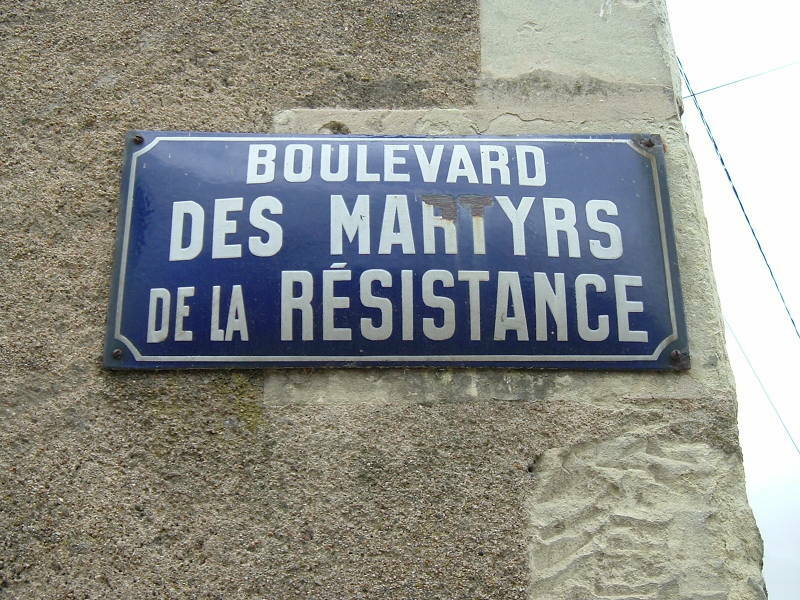 The lane is marked as Dolmen de la Cour d'Avort on some maps. 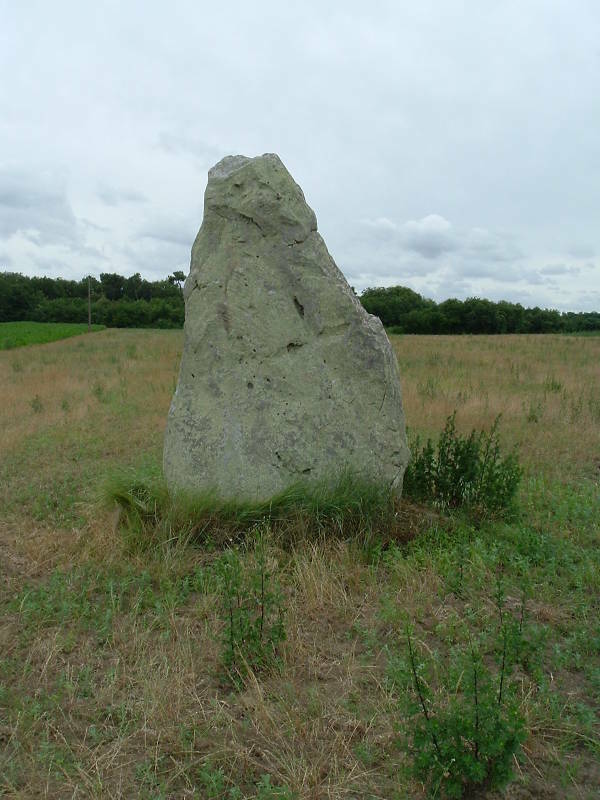 The third megalith is a menhir or free-standing stone pillar along the D 751. It's just outside the northwest side of Gennes, across from a cement plant. The menhir is almost 4 meters tall. 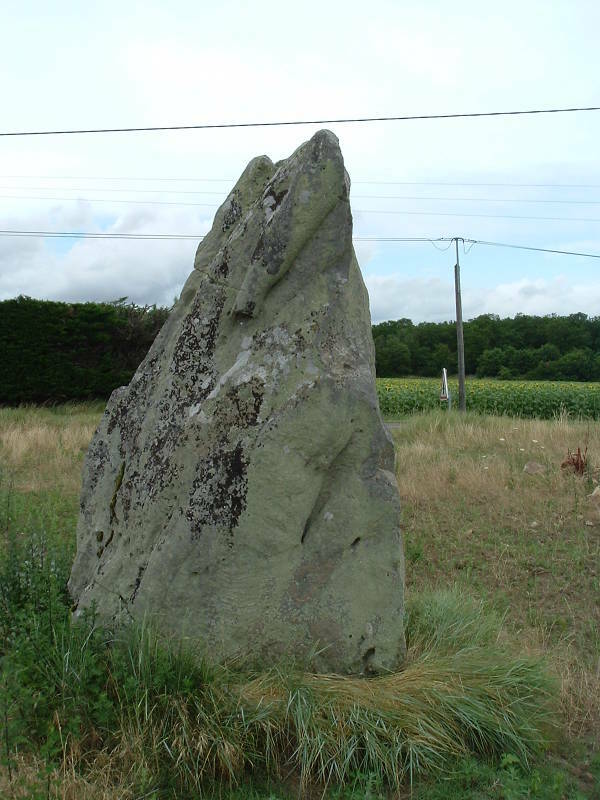 I've seen this called the Menhir du Bois Gilbert. Presumably that's the Bois Gilbert to its south.